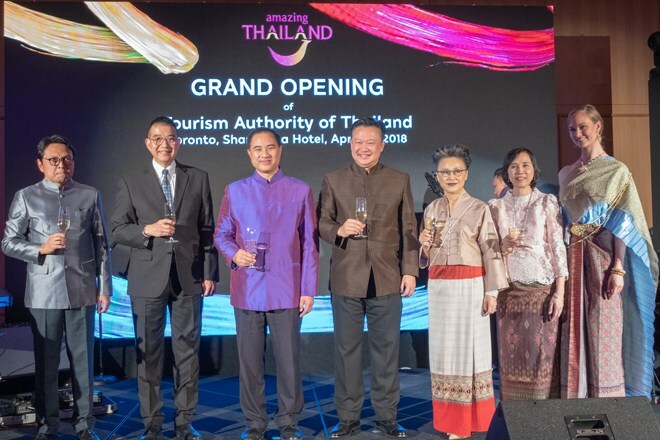 The Tourism Authority of Thailand (TAT) recently opened an office in Toronto, according to a report in The Bangkok Post, which means there are now three TAT offices in the Americas, including branches in Los Angeles and New York. According to the report, Canadian visitors are among the top spenders amongst overseas visitors who spend their vacations in Thailand and TAT governor Yuthasak Supasorn hopes the new office will help to stimulate greater visitor numbers from Canada. Canadian tourists stay in Thailand for an average of 18 days, spending THB80,000 (US$2,505) per person, per trip. According to official figures, the Canadian market generated THB80 billion in tourism income in 2017. This figure is expected to grow between 8 and 10 percent this year. The TAT is set to target three distinct groups within the Canadian sector: free independent travellers, LGBT visitors and millennials. There will also be a heavy focus on promoting Thailand as a film shoot location. Although there are currently no direct flights linking Canada to Thailand, the TAT is coordinating with various airlines including Cathay Pacific, EVA Air, Emirates, Qatar, Korean Air and Air Canada to promote travel through the airlines’ hubs. Harold Ho, vice president for supplier relations, based in Toronto, said it would be great for Thai tourism if airlines were able to operate direct flights between Canada and Thailand. According to Ho, many Canadian tourists are keen to visit major destinations such as Bangkok and Phuket. He also revealed that Thailand has become one of the top Asian destinations for Canadian visitors, after China, Hong Kong and Japan. While the TAT is eyeing up the potential for growing markets, like Canada, it is also focusing on boosting visitor numbers amongst its key markets. China is Thailand’s top source market, according to a report by thailand-business-news.com. The latest figures reveal that China sends more than one million visitors to the Kingdom per month, on average. A total of 4,161,253 arrivals were recorded between January and April 2018, up 30.56 percent year-on-year. Mr Pongpanu Svetarundra, permanent secretary, Ministry of Tourism and Sports, announced at a press briefing that the total number of visitors in January to April generated THB730.7 billion (US$22.8 billion) in tourism income. This marks a 17.55 percent increase year-on-year. In April, international visitor arrivals amounted to 3,092,725, up 9.38 percent compared to the same period in 2017. The top source markets were China, Malaysia, Laos, Russia, India, Japan, Korea, Vietnam, the US and the UK.